Walk into Jerusalem Restaurant and you will be bombarded with plaques and awards for being the best Middle Eastern restaurant in Denver–with Good reason. The food is delicious. If you’re looking for a more entree-sized plate of food, consider the Sheesh Ta’Ouk (chicken cooked with onions, stewed tomatoes, and bell peppers served over a bed of rice). Surprisingly, it’s the tomatoes that make this dish rather tasty. We recommend getting several dishes to share with at least one other person. If you’re alone, though, get the Combination – “Super Dish” (shish kabob, kifta [sirloin] kabob, chicken kabob, hummus, falafel, baba-ghanouj, tabbouleh [a type of Middle Eastern salad], fattoush [another type of Middle Eastern salad], gyro meat, and stuffed grape leaves). That ought to give you a little taste of everything. 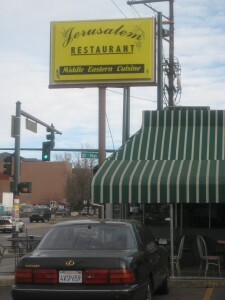 Whether you are in the mood for a casual lunch, a nice dinner, or a late-night feast, Jerusalem Restaurant has what you need, serving Denver with delicious and authentic Middle Eastern cuisine from 9am to 4am every day (and to 5am on the weekends)! One final note: be prepared to enjoy the company of your friends while you wait for the food. The kitchen at Jerusalem Restaurant is small and busy–sometimes your food can take a while. Sometimes it can take more than a while. If you’re going to take out, call ahead (303-777-8828) so you aren’t waiting a long time. If you do end up having to wait, check out the pastries on display to your left as you walk in. Perhaps a little Baklava might tide you over? 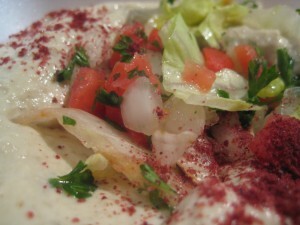 For more information, visit http://www.jerusalemrestaurant.com/. For more of Good food reviews, click here. Follow The Good Life Denver on Facebook and Twitter! This place is the best! I lived off of their Baba-Ghanouj while pregnant. I figured it was great for the baby. We love it and can’t get enough of the place! One of my absolute favorite places in Denver! I have been going there since i was super super young!